When Do You Visit Your Federal Way Dentist for a Cavity? Yeah, you know it’s not great for you, but candy is still one of your favorite snacks. After years of munching on various chocolates, you notice a little tooth pain when you chew on one side of your mouth. Instead of just ignoring that sign for help from your body and chewing on the other side, your Federal Way dentist encourages you to seek the appropriate medical attention. Treating your potential cavity sooner than later can actually save you from major dental problems down the road. You may not be aware that a cavity if forming in your mouth. That’s why it’s important to visit Drew Beaty DDS Family & Cosmetic Dentistry for regular dental checkups and cleanings, even when you feel fine. But, if you experience any of these symptoms, you need to reach out to your Federal Way preventive dentist. Visible holes or pits in your teeth. Brown, black, or white staining on the surfaces of your teeth. If your cavity has just begun, a fluoride treatment can help restore your tooth enamel. Our fluoride treatments are stronger than fluoride-infused water, toothpaste, and mouth rinses. Each treatment only takes a few minutes during your dental appointment and can dramatically improve your oral health. If your cavity has progressed past the initial enamel-eroding stage, it may be time for a filling. Luckily, you don’t have to worry about unsightly, dark amalgam fillings from us. We can provide you tooth-colored fillings to restore the stability of your tooth and block out tooth decay all while blending your restoration in with the rest of your teeth. If your cavity has progressed into a more serious stage, Dr. Beaty may recommend a dental crown. Crowns are thin, tooth-shaped and colored coverings that fit over a damaged tooth. It can restore the shape and strength of your decayed tooth and simultaneously make significant cosmetic improvements to your smile. 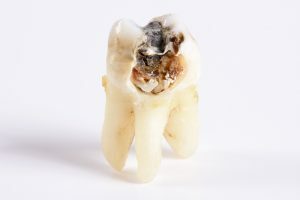 If the decay from your cavity has reached the inside of your tooth, you will definitely know it. It’s painful when dental bacteria attacks your tooth’s pulp (inside). This treatment will remove all signs of dental debris including the infected tooth pulp, fill the hole with biocompatible dental materials, and seal the inside of your tooth to prevent decay in the future. Removing your problem tooth is the last resort, but if your cavity is causing you extreme pain and that’s the best course of action, we will be happy to provide you a comfortable tooth extraction. The only way to understand what stage your cavity is in is to visit your dentist. Contact our Federal Way office today to schedule an appointment. Comments Off on When Do You Visit Your Federal Way Dentist for a Cavity?